BANGKOK, Thailand, April 10, 2014 (ENS) – A domestic Thai tanker carrying oil sludge capsized and sank southwest of Bangkok on Tuesday, releasing roughly 1,500 liters (12.5 barrels) of oil into the Gulf of Thailand. Local media say the Thai-owned vessel sank when the engine room flooded about four kilometers (2.5 miles) from shore near the Mahachai Gulf in water 6.5 meters deep. The five crewmen were rescued. The tanker was carrying about 40 times the volume of the spilled sludge. It was headed to shore to deliver the sludge to oil recycling facilities. 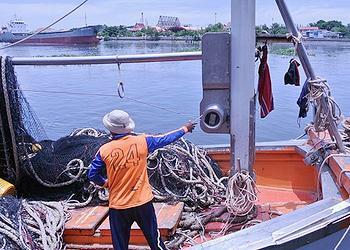 Thai authorities say work crews have already cleared away about three-quarters of the oily mess. Marine Department crews sprayed a chemical dispersant on the slick, and another tanker has removed the sunken vessel. While the spill appears to be small, the escaped oil has already fouled coastal fishing areas and mangrove forests. A fishermen’s village and mangrove forest on the coast 25 miles (40 kilometers) southwest of Bangkok has been affected, said Arthit Boonyasophat, governor of Samut Sakhon province where the spill occurred. Arthit has served as deputy director-general of Thailand’s Department of Disaster Prevention and Mitigation. Arthit told the “Bangkok Post” that the impact of an oil spill at the spot where the tanker sank would not be severe, although he warned of strong winds that might blow the oil slick toward aquatic fish farms that raise crabs, mussels and other shellfish. He has asked village leaders to document the damage and make a list of those fishermen affected in preparation for filing lawsuits – both civil and criminal – against the tanker’s owner. Provincial police have begun an investigation of the incident.